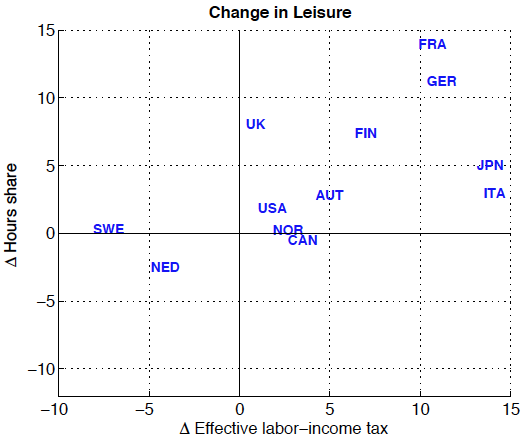 Recent research has shown that, in contrast to the prediction of basic theory, income tax increases in OECD countries have led people to spend less time working and more time on leisure activities, with little change in hours of household work. This column uses new estimates of household productivity to resolve the discrepancy between the evidence and basic theory. The OECD countries in which governments increased income taxes also tended to experience increases in the productivity of household production. Fang and McDaniel (2017), alongside our own recent work (Duernecker and Herrendorf 2018), took a closer look at how much time people in OECD countries really allocate to household production. Using recently harmonised time-use surveys, both studies independently came to the same, striking conclusion – changes in market hours were mostly offset by changes in leisure, while hours of household production hardly changed.2 Figure 1 illustrates this finding – after changes in taxes, market hours and leisure changed by similar magnitudes but in opposite directions, whereas household hours changed little in comparison. This is sharply at odds with the prediction of basic theory and it suggests that basic theory exaggerates increases in household hours after tax increases. This is important in the context of welfare calculations, given the standard notion that household hours generate less utility than leisure. Source: Duernecker and Herrendorf (2018). Understanding the reasons for the discrepancy between the evidence and basic theory requires a canonical representation of basic theory. A natural starting point is the simplest version of the growth model with market and household production and with labour as the only input into production. The usual procedure for restricting the parameters of such a model is to require it to replicate key features of the time allocation from the US, which is viewed as the benchmark economy. To be able to do this requires information on the paths of US labour-income taxes and labour productivities of market and household production, which are taken as exogenous inputs into the model. There are off-the-shelf numbers for GDP and labour-income taxes. Moreover, time-use surveys have the information required to estimate hours worked in the market and the household. In contrast, the value added of household production presents a real challenge because no obvious estimates were available. The commonly accepted practice in the macro-labour literature therefore was to make a ‘reasonable’ assumption on how productive household work is (household productivities in OECD countries essentially move ‘in sync’ with each other). Could a problem with that common practice be the reason why basic theory performed so poorly? A breakthrough came from the careful data work by Bridgman (2016), who showed how to measure the value added of US household production during the last century. He used the so-called income method of measuring value added, which underlies the satellite accounts of the BEA on household production.3 Essentially, the income method obtains the value added of household production by imputing the implicit income it generates; that is, the sum of the hours worked and the capital used in the household, each multiplied by an appropriate rental price. 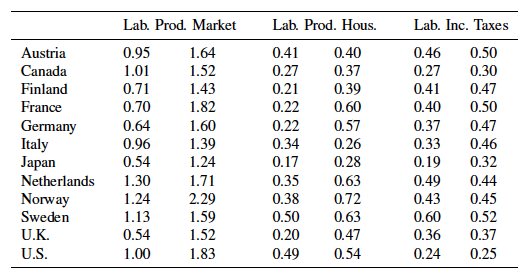 To obtain the real labour productivity of household production, nominal value added is divided by an appropriate market price of a close substitute to household value added and by the hours worked in the household. We adopted the income method and undertook the task of measuring the value added and labour productivity of household production in 12 OECD countries (Duernecker and Herrendorf 2018). Table 1 reports the resulting estimates of real household productivity for 12 OECD countries, together with the real labour productivity in the market and with taxes. The estimates for the US confirmed the result from Bridgman (2016) that the real labour productivity of household production all but stagnated during 1970–2005. This was also what existing calibrations implied. The estimates for the other countries were in sharp contrast to the usual assumption that the real labour productivity of household production evolves in sync. Instead, the estimates suggested that the real labour productivity of household production grew strongly in most OECD countries other than the US, starting from a lower initial level and then catching up with or even overtaking the US. This seemed to be a promising starting point for reconciling basic theory with the evidence. After all, if the productivity of household production increased strongly, then people could get more things done at home without having to increase their household hours. Notes: All labour productivities are relative to the US labour productivity in the market in 1970, first columns are for the initial and second columns are for the final years in sample. 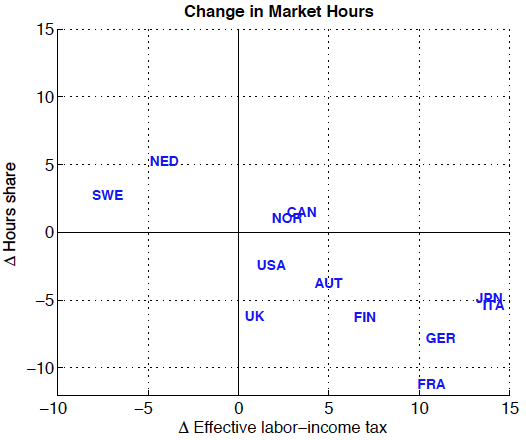 In particular, in the continental European countries that increased their labour-income taxes – Austria, France, Germany, and Italy – the model implied considerably larger decreases in market hours worked than increases in household hours. 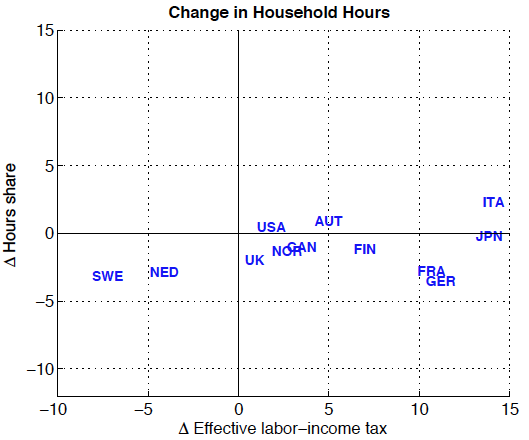 Moreover, for all 11 non-targeted OECD countries, the model implied the correct direction of the change in household hours. We also found that the crucial reason for this success was that we used our estimated labour productivities of household production. If instead we had used the usual assumption about the labour productivity in household production, then the model would have generated counterfactual changes in household hours in many OECD countries. In sum, the recent work on household production implies that the OECD countries in which governments increased labour-income taxes also tended to experience increases in the productivity of household production. Since the effects on household hours of these two changes largely offset each other, household hours did not change much in reaction to tax increases, while market hours decreased and leisure increased. An important question that emerges from this finding is whether there is a plausible channel that links increases in taxes to increases in labour productivities in the household. We argue that people in high-tax countries do productive chores in the household which people in low-tax countries outsource to the market. More research is required to understand possible additional links between taxes in the market and labour productivities in the household. An important aspect of the recent work on household production is that the income method produces estimates of household labour productivity that reconcile basic theory with the evidence. This success of the income method gives it additional credibility, which is exciting news, given that labour productivity of household production is central to answering many important questions. Bridgman et al. (2018) offers estimates of the real labour productivity of household production for a broad set of around 30 high- and middle-income countries that addresses such questions. Bridgman, B R (2016), “Home productivity,” Journal of Economic Dynamics and Control 71: 60–76. Bridgman, B R, G Duernecker and B Herrendorf (2018), “Structural transformation, marketization, and household production around the world”, Journal of Development Economics. Fang, L and C McDaniel (2017), “Home hours in the United States and Europe”, BE Journal of Macroeconomics 17. Olovsson, C (2009), “Why do Europeans work so little?,” International Economic Review 50: 39–61. Prescott, E C (2004), “Why do Americans work so much more than Europeans?”, Federal Reserve Bank of Minneapolis Quarterly Review 2-13: 28. Ragan, K S (2013), “Taxes and time use: Fiscal policy in a household production model”, American Economic Journal: Macroeconomics 5: 168–192. Ramey, V A (2009), “Time spent in home production in the Twentieth–Century United States: New estimates from old data”, Journal of Economic History 69: 1–47. Rogerson, R (2007),“Taxation and market work: is Scandinavia an outlier?”, Economic Theory 32: 59–85. Rogerson, R (2008),“Structural transformation and the deterioration of European labor market outcomes”, Journal of Political Economy 116: 235–259. Scandinavia is the notable exception where people work in the market more than theory predicts. Rogerson (2007), Olovsson (2009), and Ragan (2013) argued that this is due to the nature of public expenditures and transfers in Scandinavia. Until these studies, the existing evidence on household hours was mostly for the US time series; see, for example, Ramey (2009). See https://www.bea.gov/household-productionfor further details and references. Table 2 in Duernecker and Herrendorf (2018) reports the details of our findings.